Ursine Logic's Peace, Environment, Human Rights stores. You can't change the world if you continue to spend your hard-earned money supporting those whose policies you oppose. The best way to fight back is to support those who believe in peace and saving the planet, and who believe in equal respect and opportunity for everyone, no matter the color of their skin, their gender, or their choice to not contribute to overpopulation or exploitation of our planet's remaining natural resources. Instead of supporting big box corporate warehouse stores, buy your gifts, t-shirts, and other apparel from small, independent artists who work hard to bring your their art on everything from bumperstickers to works of art suitable for the most important of gifts. Here are some shopping suggestions that include my own stores and also those whose shops and artwork I'm promoting because I agree with their points of view and hope that you support them too. 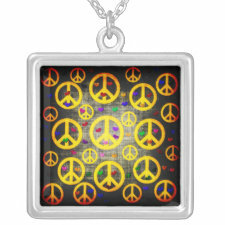 Check out my latest PEACE designs at Crazy Old Lady of Peace's Zazzle Store. Peace is a work in progress. Without new voices and new visions for a better world without war, it will remain an unfinished work. That is why the anti-war view needs to stay in the public realm. The war machine is huge and well-fed and while one tiny voice wearing a message of peace on a t-shirt doesn't seem to be a very effective response, I prefer to think of it this way: you're not trying to change the world. You're trying to change one person at a time into seeing the world in a less hostile and less selfish way. 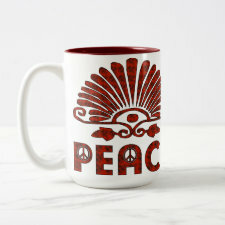 A button, a magnet, a coffee mug, these are all ways to spread the simple and powerful message of peace. Wear them, share them, give them as gifts because it's a way to spread the message while giving something in return. 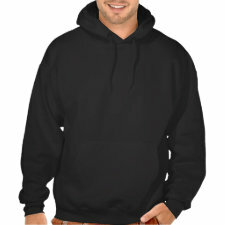 Check out my latest designs at Crazy Old Lady of Peace's Zazzle Store. Why shop at big box corporate warehouses who fund the war machine when you can spend your money supporting independent artists who share your values when it comes to creating a more peaceful and tolerant world? Many of us design from our homes and upload our images to Print on Demand websites that allow you to purchase them directly on the products of your choice. Here are some more choices for peace themed designs on shirts and other products. These are all indivually designed by artists struggling to make a living. We receive a small percentage of each sale featuring our art. We survive with your support. One of the biggest challenges facing us is stopping and hopefully reversing the damage humans have done to the planet. Since war is one of the most destructive forces our planet must endure, supporting peace takes on equal weight with protecting the environment. Clean air and drinking water, safe organically grown real food, and replacing limited resources with sustainable ones should be the primary objective of people on this planet. But it will take time, money, and enough educated voices to take on the entrenched powers that get rich off a planet dependent on oil and fast, cheap synthetic food. The education process begins with the individual. You're not changing the world. You are sharing your knowledge with one person at a time. T-shirts are good way to begin a conversation. Many of the products offered in my shops can be customized and used as teaching materials and fundraiser gifts and thank you gifts. And by purchasing them, you support small independent artists instead of faceless corporate machines. Due to political and religious influences, one of the most serious problems facing the planet doesn't get the press it deserves: overpopulation. These shops are devoted to getting the word out and also honoring the unselfish choice made by those who choose to remain child-free by choice. There are many reasons to not bring more people onto an abused planet with ever lessening resources, and for many people it is and should remain a private choice. But that choice also needs to have the stigma removed from it so it can be understood it is something made from concern for the planet and its people. The choice is an individual one and it is up to people to educate each other. When spirituality was taken from the individual and handed over to the unholy intermediaries, the use of religion as a method of control was established. And in today's world, religious beliefs have become a political tool to shape policies no decent human being would embrace without the cloak of religion covering their stench. Religion is no longer about spirituality and individual worship in communion with whatever deity, enlightened teacher, or awe-inspiring creations from nature you choose to acknowledge; it has become a way for others to use one group to promote hateful and greedy agendas of another. It has become about using, manipulating, controlling and directing people through their own fears and intolerance, to act as shills for corporate thuggery and thievery. That's why I and others fight so hard for our right to not believe in some mythical, non-existent figure, and to educate others on what religion has become in the hands of the greedy and the evil. Please help educate others about the difference between spiritual communion for betterment of self, and the manipulation of fears and insecurities by those with a far more selfish agenda. The War On Drugs should be called The War On The Poor and People Of Color. It has not stopped the use of hard and destructive drugs. Instead it has led to private prisons that needed bodies in them full-time to remain profitable. That meant arresting more and more pot smokers and ignoring the huge problem of Meth and Heroin ovetaking the country. Junkies are harder to manage and have a tendency to die off, but marijuana smokers are mostly poor people who got caught with a small amount of personal use weed. Throw in the moralist theocrats who can't stand the idea that anyone would want an escape other than religion, whether it was beer, wine, or weed, and you have the greatest crime of the century: standing in the way of learning about a remarkable plant with numerous health and healing properties. Two states have already legalized recreational use and many states allow medical use. Celebrate the right to celebrate with your drug of choice, whether it is sugar, caffeine, alcohol, fried food, or weed with one of these artistic celebrations of marijuana. PEACE ORGANIZATIONS Wikipedia page listing peace groups and their specific areas of interest. Great resource. PEACE RESOURCES GROUP "The Peace Resources Group offers services to all those searching for peace and to all people and groups that are affected by conflict and violence." INTERNATIONAL WOMEN'S PEACE GROUP "Behind every great world leader there has been a great mother, demonstrating the very nature of all mothers � providing love and healing for their families."